Australian cricketers are "prepared to strike" if a contract dispute is not resolved, which could have an impact on the Ashes at the end of the year. In March, Cricket Australia proposed salary increases for men and women, but this would mean players no longer receive a percentage of CA's revenue. The offer was rejected and CA said it would not pay players after 30 June. 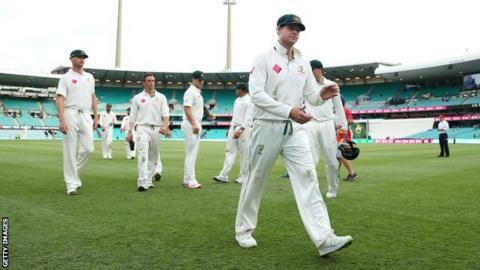 Ex-Australia captain Mark Taylor said the Australian Cricketers' Association "aren't negotiating at all". Taylor, who is also a CA board member, told a sports chat show on Nine Network on Sunday: "I have had players say to me in January that we could well be on strike in July." A letter from CA chief executive James Sutherland to the players' association said 2016-17 contracts would not be renewed without a new agreement. But the ACA said the proposal was "a win for cricket administrators but a loss for cricket". ACA chief executive Alistair Nicholson added: "The point lost on CA is that the players will not respond to threats." Several Test players responded on Twitter, using the #fairshare hashtag. Australian fast bowler Pat Cummins tweeted on social media in response to the email: "Players are staying strong #fairshare". Former Test paceman Mitchell Johnson added: "Players past & present will stay strong #fairshare". If the dispute is not resolved, there would be uncertainty over what team Australia could field after 30 June, with a two-Test series scheduled in August in Bangladesh before a home Ashes showdown with England, which runs from 23 November 2017 to 8 January 2018. In a letter sent by CA to the ACA, chief executive James Sutherland said "players with contracts expiring in 2016-17 will not have contracts for 2017-18" unless the Australian Cricketers' Association (ACA) negotiates a new MoU (Memorandum of Understanding)". The current MoU will expire midway through the women's World Cup, which starts in England and Wales on 24 June. "The Australian women's World Cup squad will be paid in advance of the June-July World Cup and will be employed until the end of the event," Sutherland said. CA declined to comment further when contacted by Reuters. "There is incoherence and aggression in what we have experienced at the negotiating table from CA," Nicholson said in a statement on Sunday. "However, despite these threats, the players affirm their offer to participate in independent mediation. "Quite simply, one side entered these negotiations in good faith with an intent to provide a win-win result, and the other is trying to remove player unity and drive a wedge in Australian cricket."